My new game Arcanoria Chronicles is coming along nicely! I’ve been doing a bunch of research, including learning about precious metals, and ancient mining practices. And I’ve been working on backstory. Lots of backstory. You can’t have a good RPG without deep characters, with realistic motivations. One of the first things that becomes obvious when writing backstory is that you need other stories behind the stories, and then the stories all require a setting, and more characters, and then THEY have to have motivations, and be realistic. And then we have the possibility of complex relationships between people, and factions of people. This is exactly what’s currently cooking on the front burner in Arcanoria Chronicles! But there’s already more story than we can come close to covering in one “short” RPG. So, we’ve changed the name slightly! “Arcanoria Chronicles” will now be a series of (relatively!) short adventure games, with the target for each “Chapter” to be playable end-to-end in about 10-20 hours. Then we’ll release additional Chapters over time, chronicling different events and the adventures of some of the main characters in the Arcanoria mythos. 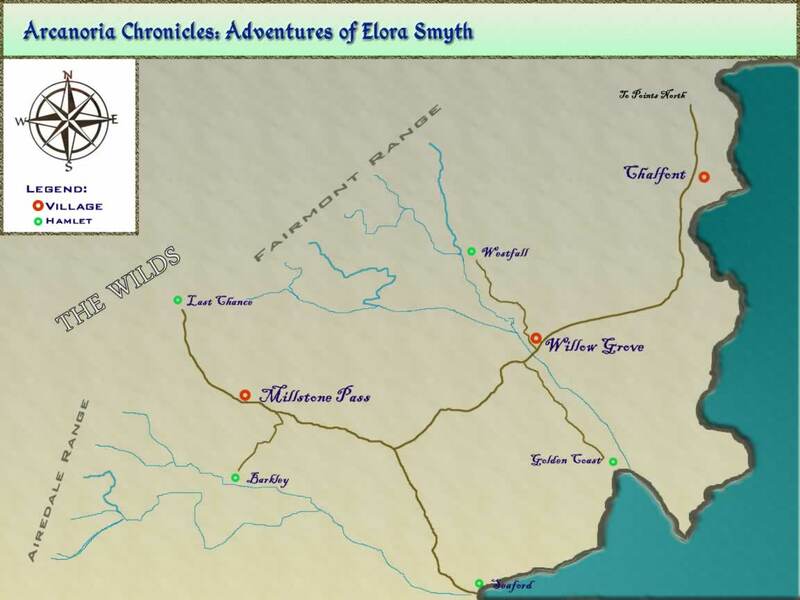 The first chapter will be called: “Arcanoria Chronicles – Chapter 1: Early Adventures of Elora Smyth”. And here’s a sneak preview of the map of the area, which I’ve been working on, to go along with all the backstory.